May 28, 2011  Egypt ended a four-year-old blockade of the Gaza Strip on Saturday, bringing badly needed relief to the Palestinian territory's 1.5 million people. Under the new system, there are few restrictions on who comes and goes, but Palestinian men between the ages of 18 and 40 must get visas before being allowed to enter Egypt. May 28, 2011  Egypt formally reopens its border with the Hamas-ruled Gaza Strip on Saturday. It's an offshoot of the Egyptian-mediated reconciliation between Hamas and Fatah, the dominant Palestinian faction in the West Bank. NPR's Soraya Sarhaddi Nelson talks with Scott Simon from Rafah. May 26, 2011  One line from President Obama's recent speech stirred up anger in Congress and Israel: "Borders of Israel and Palestine should be based on the 1967 lines with mutually agreed swaps." 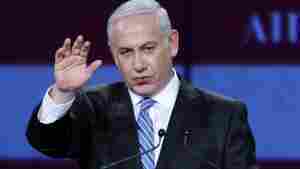 Israeli Prime Minister Benjamin Netanyahu declared his country will not return to those "indefensible borders." Double Take 'Toons: Bibi's Comeback? May 26, 2011  Neither Israeli Prime Minister Netanyahu nor Nate Beeler are happy with President Obama's peace proposals, while Steve Greenberg seeks a sense of direction. 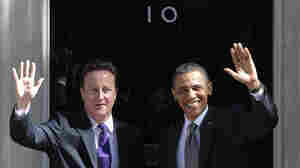 May 25, 2011  The two leaders took questions on the NATO actions in Afghanistan and Libya, and other topics. Later, Obama will address parliament. May 24, 2011  In a speech to a joint meeting of Congress on Tuesday, the Israeli prime minister thanked U.S. lawmakers for their unswerving support and laid down a hard line on any new peace talks with the Palestinians. 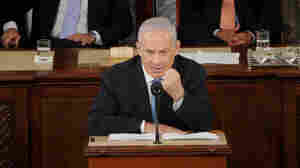 May 24, 2011  Israeli Prime Minister Benjamin Netanyahu speaks to Congress today. Since President Obama's policy speech on the Middle East, controversy has brewed over America's relationship with Israel and the U.S. stance on the Israeli-Palestinian conflict. Host Michel Martin speaks with Israeli Danny Shaket and Palestinian Ahmad Omeir, two youth leaders working with One Voice, a grassroots organization aiming to resolve the Israeli-Palestinian conflict. 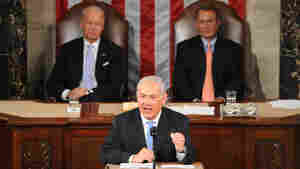 May 24, 2011  Israeli Prime Minister Benjamin Netanyahu speaks before a joint meeting of Congress on Tuesday. Netanyahu gave a bit of a preview of his congressional address Monday night to more than 10,000 supporters at the annual conference of the pro-Israel lobby AIPAC.